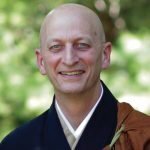 Exploring Yunmen’s reply to a monk in the case, “You’ve missed it,” what is the transcendent use of speech, and how does it open us to practicing what is real and what is true? Wishing for the gladness of all, how do we truly begin such a goal by working with ourself? Accepting that it is not easy, how can our lives become truly Alive? *Note: We experienced Technical Audio difficulties with this talk. On 2/5 we replaced the audio file with an improvement. If you downloaded the old audio, you may wish to re-download this one. The audio gets better 5 minutes into this talk.